Some people have taken this idea and decided that it might be smart to use winter tires all year long. However, that is not a good idea because of the very way that those tires are designed. 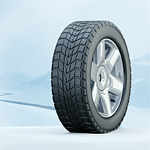 Winter tires have trouble holding up when it comes time for things to warm up. You will lose more money by trying to save money if you choose to leave your winter tires on all year. You make the performance of your vehicle suffer as well. At the end of the day this is simply not worth your time so to speak. Make sure to change your tires out as the seasons go by.